Page:Should the SU create the positions of ‘Societies Councillor’ and ‘Sports Councillor’ on SU Council? Should the SU create the positions of ‘Societies Councillor’ and ‘Sports Councillor’ on SU Council? This is a referendum proposal for the upcoming 2019 Elections. SU Council represents students. The membership of SU Council comprises departmental councillors, representative councillors and an ethical environmental councillor. This referendum is proposing to introduce two new councillors. If passed, the following amendments will be made to Bye-Law 3 Student’s Union Council and Bye- Law 7 Working Committees [LINK]. Submit a statement 'for' or 'against' these proposals (200 word maximum). Submit any alternative or related proposals (100 word maximum): these require the support of 500 students. If you want to submit an alternative or related proposal, we will publish this here to allow students to 'upvote' to show their support. 500 or more 'upvotes' will mean that your alternative or related proposal will be included in the ballot. 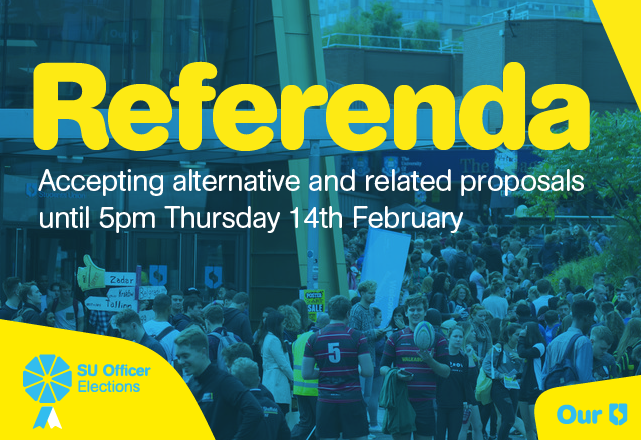 On Friday 15th February (10am) all final referendum proposals (including any alternative or related proposals) will be available to view online. Voting will be from 25th Feb – 28th Feb. Anyone wishing to campaign for or against a referendum must adhere to the Referendum Regulations.